A Springsoft hot water conditioner is a special water conditioner designed to treat water that has already been heated. These systems are equipped with custom stainless steel media tanks and valve bodies that can accommodate water up to 180 degrees fahrenheit. Hot water conditioners may be utilized for a variety of applications, however, they are generally used to soften the hot water line feeding a restaurant's dishwasher. In many situations, space and/or budget does not allow for a commercial water conditioner to soften all of the hot water. Our space saving units are appropriately sized to fit under the counter of a restaurant dishwasher. 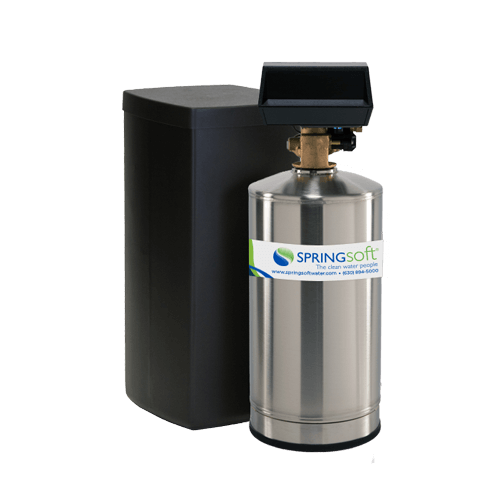 The Springsoft single tank water conditioner consists of one stainless steel media tank and one regenerant (brine) tank. These units are available with either a time clock or meter demand control module and can regenerate up to once per day. 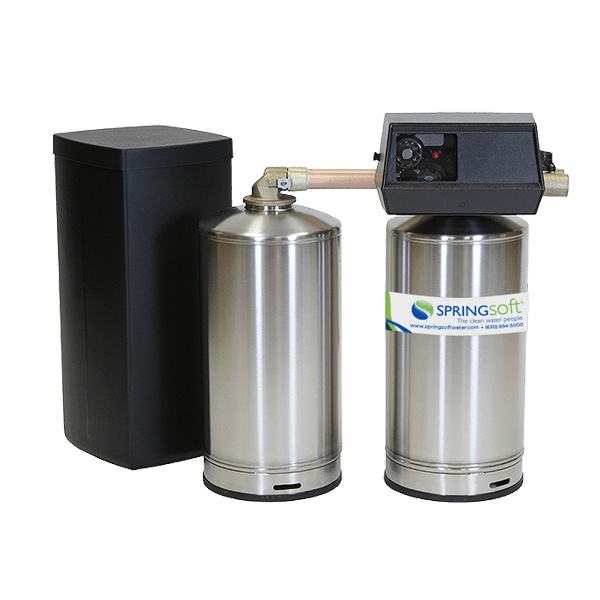 The Springsoft twin tank demand water conditioner consists of two stainless steel media tanks operating in alternating stand-by along with one regenerant (brine) tank. This alternating stand-by system provides 24 hours of soft water each and every day. Since one resin tank is always operational, raw hard water does not enter the water supply during regeneration as would a single tank system. This system can regenerate multiple times per day if the demand requires. To enable the system to fit under the dishwasher, the tanks must be small in size thus reducing total softening capacity. The twin tank system is not compromised by reduced capacity because it can recycle as often as required and is not burdened with insufficient reserve.